The Polo Lounge does not offer any booking services that we know. You can always contact them to check. A visit to The Polo Lounge in Merchant City sets visitors up for lots of fun. There's so much to see and do in this part of the city. 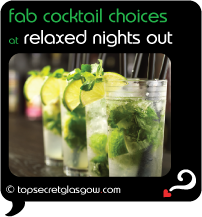 Hidden from view, near bustling Glassford Street, this buzzing gay venue opens its doors for party times to get going... and if you arrive early enough you get in free. A luxurious ground floor bar has a mezzanine area that's perfect for spotting your next date! Lots of squashy armchairs and sofas, lamps and ornate mirrors give an almost baronial feel to The Polo Lounge. Head downstairs to both dance areas. One has all the latest tunes, and the smaller ones keeps disco and camp old classics live and well, thank you very much. 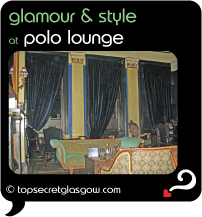 Much loved and always a lively attraction in Glasgow's gay scene, The Polo Lounge makes a top choice for a night on the tiles. Excited about your evening at The Polo Lounge? With a bunch of friends, some buzzing pre theatre with energy and 'up' vibe might be just right. Part of Tron Theatre, Tron Victorian Bar (tel: +44 (0) 141 552 8587) offers one of the most unique dining spaces in the city. The bar really is from Victorian times, and shine proudly to one side. The menu has its eye on Scottish cuisine, maybe throwing in a surprise or two along the way. A leading light in the restored Merchant City,City Merchant /Browse/Restaurant/City_Merchant(reveal best table deals?) has been winning dining fans since the 1980s. With its eye on the best Scottish fish and game dishes, the dining room here is tranquil and tasteful. Enjoying delicious pre theatre dining nearby The Polo Lounge will make sure you have a fantastic date. Perfectly poised in glamorous Merchant Square, the one and only Arisaig /Browse/Restaurant/Arisaig_Restaurant(reveal best table deals?) brings its very own charm and quirky bits to Scottish cuisine. You'll understand when you read their superior menus. On top of their amazing meals, you can sit 'outside' in Merchant Square at any time of year, which is a lovely advantage in the winter months. Perfection... and it really is nearby The Polo Lounge. 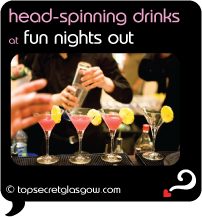 The buzz of the city centre and the fun to be had in Merchant City probably has you in the party mood. Great! The style crowd and the happy Merchant City party animals have made Brutti Ma Buoni (tel: +44 (0) 141 552 0001) their own. Part of the stylish Brunswick Hotel, this hip cafe-bar knows its own good taste, and shares it generously with all. On performance nights, the buzz in Tron Bar feels like it might take the roof off! One glass wall lets the light flood in - or you can sit there in the evening and watch this cool part of Merchant City float by. Nearby The Polo Lounge you'll find some of the classy hotels Glasgow is famous for. A stay in Merchant City might mean a stay at the Millennium Hotel /Browse/Restaurant/Brasserie_on_George_Square(reveal best table deals?) http://www.laterooms.com/en/p8275/hotel-reservations/83721_millennium-hotel-glasgow-glasgow.aspx(reveal best room deals?) . Looking over George Square, this beautiful Hotel is full of energy and quiet style. And their restaurant, Brasserie on George Square affords diners the chance to watch the comings and goings in elegant George Square. Just off George Square and nearby The Polo Lounge, Ramada Jarvis Hotel http://www.laterooms.com/en/p8275/hotel-reservations/13240_ramada-hotel-glasgow.aspx(reveal best room deals?) offers excellent city centre rooms. Within sight of Polo Lounge, and close to both major city centre train stations, this hotel has a lot going for it - service and quality rooms at the top of the list. 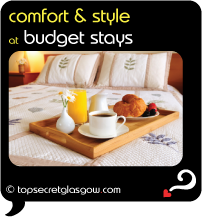 Friendly old Glasgow makes sure that all visitors are make comfy, whatever their budget. 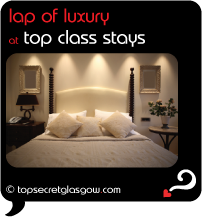 An overnight stay that includes a night in The Polo Lounge might feel right at home in Merchant Lodge http://www.laterooms.com/en/p8275/hotel-reservations/149905_the-merchant-lodge-glasgow.aspx(reveal best room deals?) . Hidden from view off Glassford Street, the lovely restored building houses smart rooms with just about all the services you need. Lovely, value accommodation indeed, literally across the street from The Polo Lounge. Had a wonderful time, being a party animal in The Polo Lounge? With so many exciting Glasgow treasures close by, you're sure to have some happy memories. Why not share them with everyone? 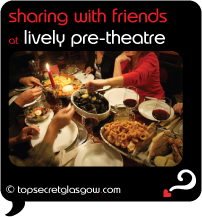 Send us your memory here and we'll then publish your very own Top Secret Glasgow pages on the web. Add a photo if you have one. You can then impress everyone with the fun times you've been having in Glasgow. Great news! Finding this page means you can now join our VIP list for The Polo Lounge. Grab your very own web page all about The Polo Lounge. Do you have a special story about The Polo Lounge? A funny experience? A grand occasion? A funky photo? A personal tip? A top secret? public Glassford Street, Glasshouse (NCP) in the hood!